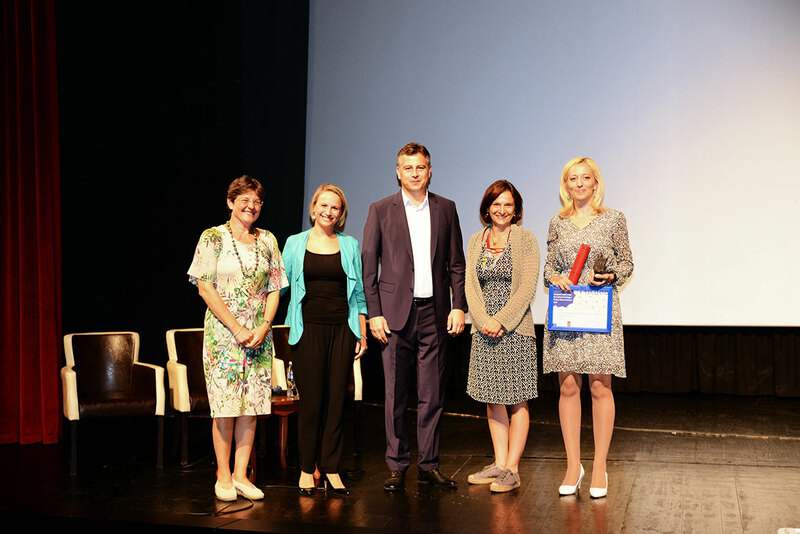 The first ever Grand Prix of the EU Prize for Cultural Heritage / Europa Nostra Awards was presented in Serbia to the Conservation Study of the Village Gostuša in Pirot District on 31 August 2016. Several hundreds of heritage and cultural professionals, volunteers and supporters, and several representatives from regional, national and European institutions, gathered at the Cultural Centre of Pirot to celebrate this outstanding heritage achievement from Serbia. Sneška Quaedvlieg-Mihailović, Secretary General of Europa Nostra and Nadežda Dramićanin, from the EU Delegation to Serbia, congratulated the team of researchers led by Elena Vasić Petrović, Director of the Institute for Cultural Heritage Preservation Niš, for their exemplary architectural survey. Vladan Vasic, Mayor of Pirot, and Vesna Marjanović, Member of the Serbian Delegation to the Parliamentary Assembly of the Council of Europe, also addressed the audience. “The European Commission published yesterday its long-awaited proposal for the European Year of Cultural Heritage 2018. It was with great delight that I received the wonderful news in Pirot, on the eve of the ceremony honouring the first ever Grand Prix winner of the European Heritage Awards from Serbia - the Conservation Study of the Village Gostuša in Pirot District,” stated Sneška Quaedvlieg-Mihailović, in her address. “Europa Nostra stands ready to actively and creatively support the preparation of the Year now. We are working with our winners, our members, partners and supporters from across Europe to make the European Year of Cultural Heritage a memorable one for citizens in Europe and beyond. Civil society should be at the heart of shaping this Year. It should not have an end – on the contrary, it should be the start of something more, more Europe and more passion for cultural heritage!” stressed the Secretary General of Europa Nostra. Prior to the presentation of the Grand Prix, Elena Vasić Petrović and Ivana Cvetković, Associate at Institute for Cultural Heritage Preservation Niš, talked about the award-winning project and the outcomes of the workshops held the previous days. Višnja Kisić, Secretary General of Europa Nostra Serbia, presented the key findings of the European policy Report ‘Cultural Heritage Counts for Europe’. This extensive Report – recently produced by Europa Nostra together with five partners – provides compelling evidence of the value of heritage and its positive impact on Europe’s economy, culture, and society, as well as the environment. The programme ended with the opening of the exhibition ‘Gostuša Village’. Guided tours of Gostuša and surrounding areas took place on 28 August. A series of workshops and lectures on key topics related to the award-winning Conservation Study were held on 29-30 August in Dojkinci village with the participation of experts from the Institute for Cultural Heritage Preservation, the Institute for Natural Heritage Conservation, the Ministry of Civil Engineering, Transport and Infrastructure, the Tourism Organisation of Serbia, the Tourism Organisation of Pirot, NGOs and the University of Niš as well as local authorities and representatives from the local community. The Conservation Study of the Village Gostuša was declared a Grand Prix laureate and received €10,000 at the European Heritage Awards Ceremony held on 24 May 2016 at the Zarzuela Theatre in Madrid, Spain. This major event was co-hosted by Maestro Plácido Domingo, President of Europa Nostra, and Tibor Navracsics, European Commissioner for Education, Culture, Youth and Sport. The ceremony in Pirot was organised by the Institute for Cultural Heritage Preservation Niš and the City of Pirot, in collaboration with European Commission and Europa Nostra and with the kind support of the Cultural Centre of Pirot, the Tourism Organisation of Pirot and the Foundation Architect Aleksandar Radović.